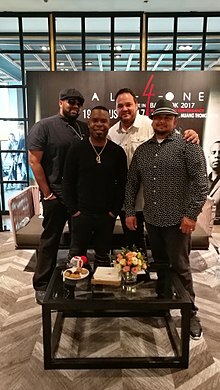 All-4-One is an American male R&B and pop group best known for their hit single "I Swear" (a cover of the song originally recorded by country music artist John Michael Montgomery a year prior) from their self-titled 1994 debut album. The group comprises Jamie Jones, Delious Kennedy, Alfred Nevarez, and Tony Borowiak, all from the Antelope Valley and Mojave, California areas, but are based in the Greater Los Angeles Area. The group has sold 22 million records worldwide. This page uses material from the Wikipedia article "All-4-One" (contributors), which is released under the Creative Commons Attribution-Share-Alike License 3.0.